Music is interesting. Sometimes good music can stand out of a scene, and sometimes it can lie invisible, subtly enhancing an experience without making its presence known. Sometimes bad songs can worm their way into my head and refuse to leave, tormenting me for hours. The best music can make a good show great, or a great show legendary. Music communicates emotion—loneliness, nostalgia, joy, terror, sorrow, excitement—and matching the right song to a scene can make or break it. Obviously for a series about music, good music is essential. BECK featured amazing music, from 50 Cent Wisdom to a moving cover of I’ve Got a Feeling, and Nodame Cantabile has an extremely strong soundtrack including Rhapsody in Blue and Allegro Cantabile. Even K-ON! has solid music (think about all the times Don’t Say Lazy was played this spring). But when a series isn’t about music, it can be even more satisfying when the music is right. Cowboy Bebop has one of the best soundtracks around, featuring both diversity and quality. Between the series and the film, it covers everything from country to trance, jazz to rock, and parade march to elegy. Moreover, virtually every song is excellent, from the iconic opening Tank! and closing The Real Folk Blues to random background and insert songs like Mushroom Hunting and Go Go Cactus Man! (Cowboy Andy’s theme). Bebop‘s soundtrack brings the show to life, reflecting scenes, characters, and locations. Beyond the Clouds (Kumo no Mukou, Yakusoku no Basho) is another work with a spectacular musical score. I actually listened to the soundtrack for Beyond the Clouds long before I saw the film, and in the intervening time my excitement grew and grew as I listened to TENMON’s score over and over. The theme that plays when Sayuri and Hiroki reunite and again when she awakens is beautiful and moving, and it stuck in my head for weeks. Even a good opening or ending can help cement a series into our memories. The two seasons of ef stand out as much from their ever-changing openings and rotating endings as they do from their unique direction and visual styles. The first season of The Melancholy of Haruhi Suzumiya gained fame from its meme-inducing ending theme (and accompanying dance). And how many people remember getting hooked on Eden of the East because of its awesome (if pretentious) opening from Oasis? I swear this makes sense if you watch the episode. 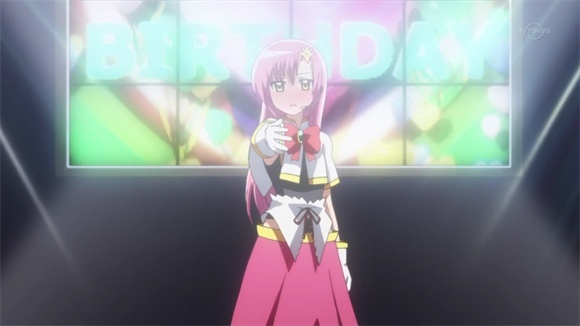 So when Hayate no Gotoku!! featured none other than Cruel Angel’s Thesis from Neon Genesis Evangelion, I nearly jumped out of my seat. Hayate makes all sorts of references to other shows, old and new, but I never expected it to include such a visible tribute to Evangelion. 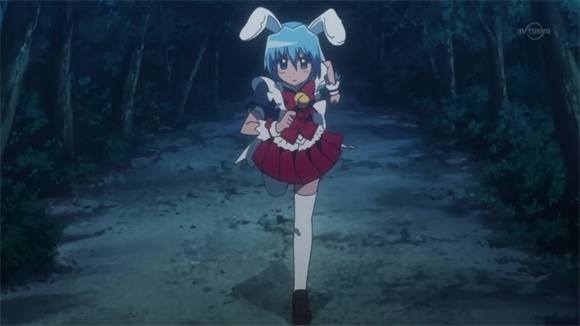 Moreover, it comes at a great time in the plot; as Hinagiku sings “Boy, beome a legend”, Hayate makes a daring dash through the middle of the festival dressed as a catgirl maid—and while that sounds totally bizarre out of context, I was shaking with excitement when I watched it. I thought the scene was a great tribute both to the series and to the emotions the song ignites, and while it may not be as deep or meaningful as the other entries in this list, it gets a place as Moment #4.